reMADE DXB‘s cozy space at Objects and Elements in Al Quoz is like one of those rooms in Finders Keepers. There’s plenty of interesting, pretty things along the walls, on the ceiling, on every space of the shelves and tables. THey’re just everywhere. But it doesn’t look messy at all. It’s controlled chaos, I think, which adds to the charm of the little nook. 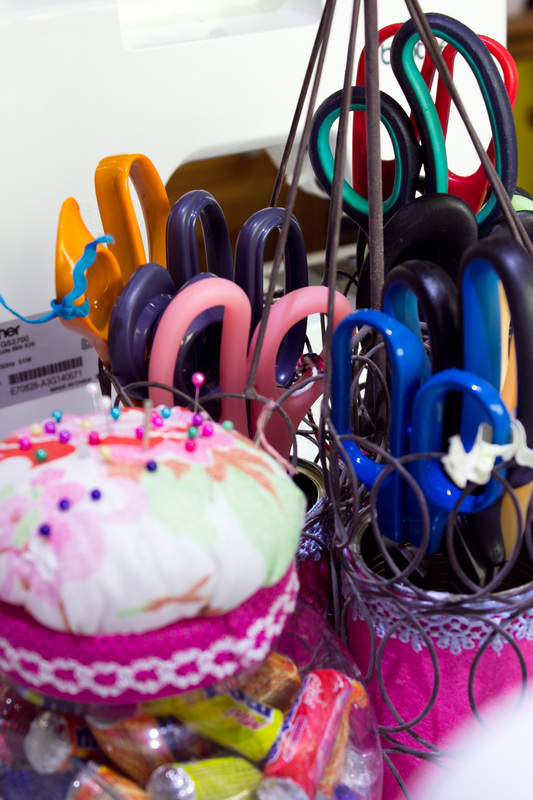 Like this collection of sewing scissors which would make Edward Scissorhands jealous. 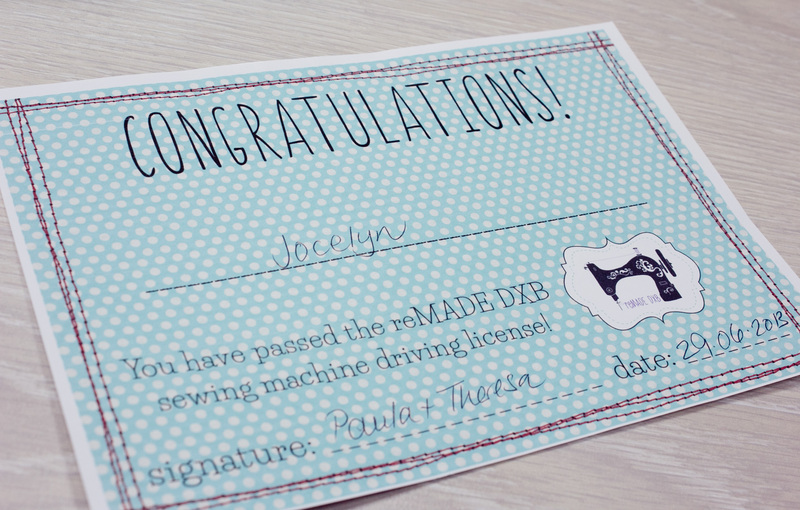 I visited reMADE last Saturday to attend their ever-popular Sewing Machine Driving License class. Four other bobbin-heads (I kill me!) were present for the afternoon session. Unfortunately, Eliza was not well so she missed it this time. However, fellow Amira Louise was there. It could not have turned out better! Theresa and Paula, the two amazing superwomen who run reMADE are brilliant. It was a very casual setting, each of us have a sewing machine in front of us, or those who have their own can bring their own, and they they slowly went around the table pointing out the important parts of the machine. The first task we had to do was to thread our bobbins. We each were given an empty bobbin which we placed onto the thingie (I’ll get the proper terminology later) and then put our thread onto its spool pin. There is a nifty guide at the top of the machine on how to wind the thread from the spool onto the bobbin. Then we plugged our machines in, switched them on and pressed on the pedal and away we went! That was quite fun, but then we had to take the bobbin out and into the bobbin case. And then it was time to thread the machine. Not as straightforward as it sounds but also not as complicated either. The machine has guides all over it (follow the numbers) which make it nearly idiot-proof. We were given two pieces of cloth and we had to sew a straight line. My first couple of lines were a bit wonky, I was tugging on the fabric the first time and the next I was breaking speed limits! Woohoo! After that we had a go at doing the reverse stitch. The machine has a lever showing a u-turn which you hold down as your foot remains pressed down ever so gently on the pedal. 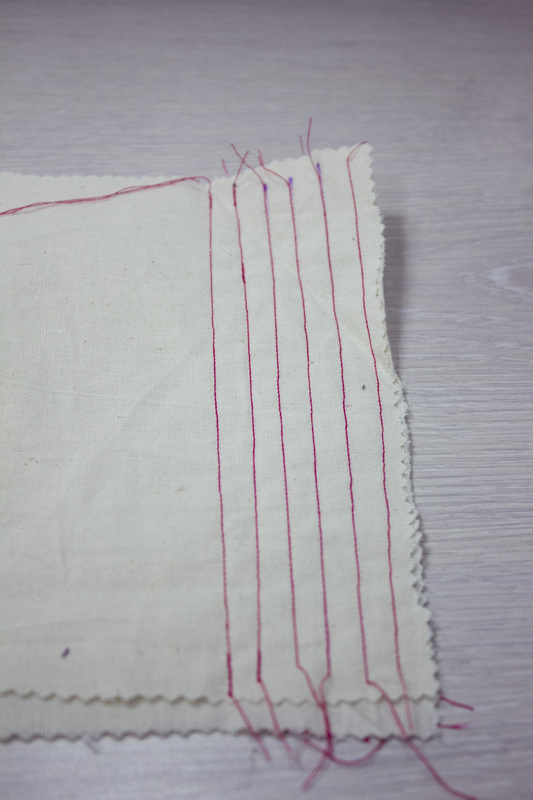 The reverse stitch basically “seals” the start and end of your stitches, locking them so they don’t unravel easily. We also did sharp corners which you achieve my stopping where you want to pivot making sure the needle is pressed down on your fabric, lift the presser foot and pivot. This is basically how you make simple square bags and pillow cases. After a few more straight lines, it was time to do swirls. 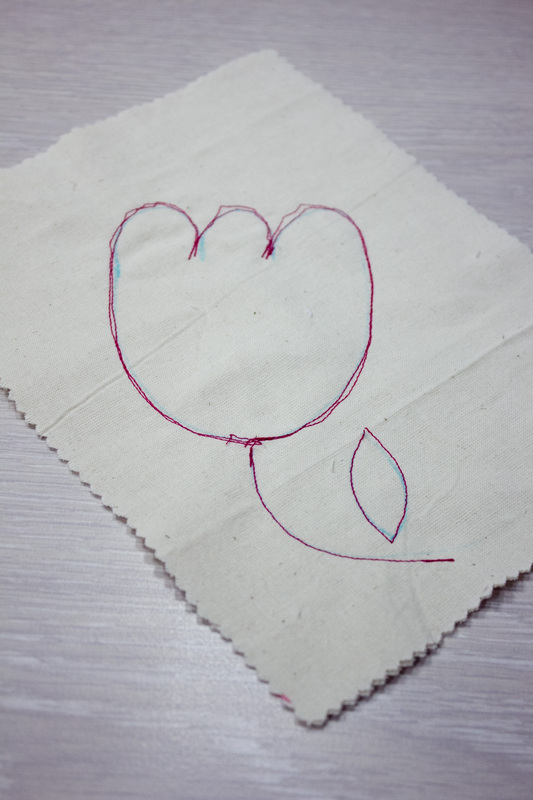 I was quite ambitious and drew this tulip, something which I have been doodling on cards and edges of notebooks for years. Paula kindly helped me map out my route, start with the stem, then the leaf and then for the flower itself Paula said to start at the bottom centre then up the right and slowly around each petal and then back down the bottom again. Sure thing! Easy peasy. Not! I ripped the stem once because I was way off course then had to use the hand wheel for the curves just get some sort of precision. Paula suggested I go over everything again to give it a shabby chic look. I guess if I erased the pen I can still see a tulip, or what looks like a minion’s really pudgy hand and fingers. Monogram! Gulp. I had to idea how to stylize my initials. 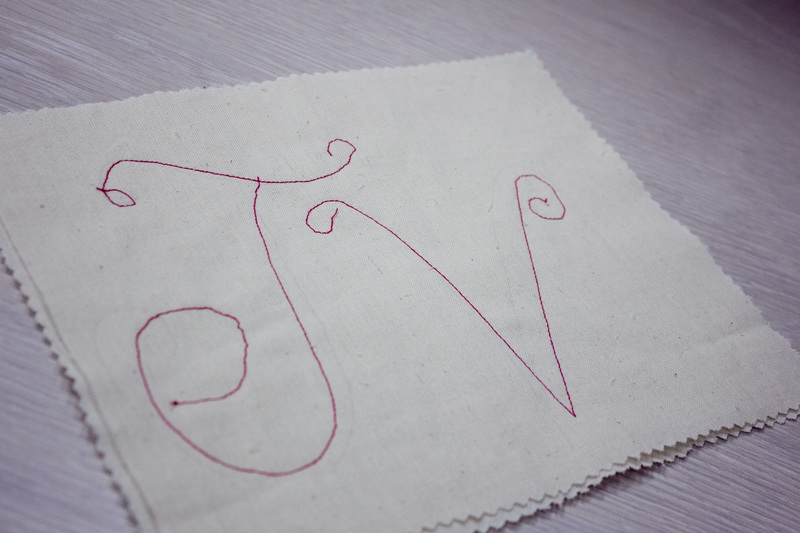 The J looked like a T, but I made extensive use of the hand wheel so the V is a little better. Yep, not my favourite part of the day, but I still had fun! Others made hearts and really pretty freeform swirls. There was an exam too! Not very difficult, but fun! We had to make bookmarks. There was a tray piled with pre-cut fabrics and a rather rustic pail of ribbons and lace as trims. Louise beat me to the cupcake fabric! But I managed to get one of the cool skulls and some lovely patterned ones. We could make as many as we wanted so I made three. Ignore the messy reverse stitches. When we were done with these, we were allowed to keep on practicing. I grabbed another pair of the rectangular fabric and decided I will try and make a small pouch/bag. The inside was not so difficult as it was just U-shaped stitching. 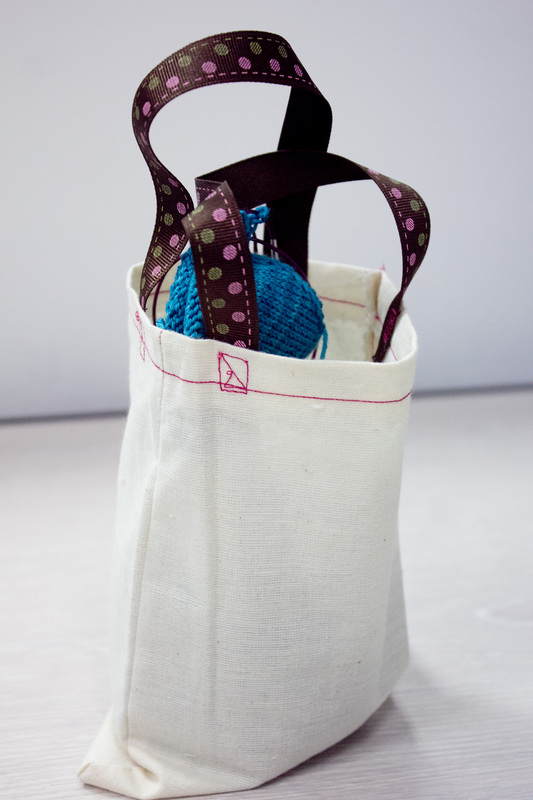 I initially wanted to do a drawstring type pouch and Theresa was so kind enough to figure out how to do it. I think I confused her with my messy stitching and she completely forgot how to create the gaps for a drawstring purse. 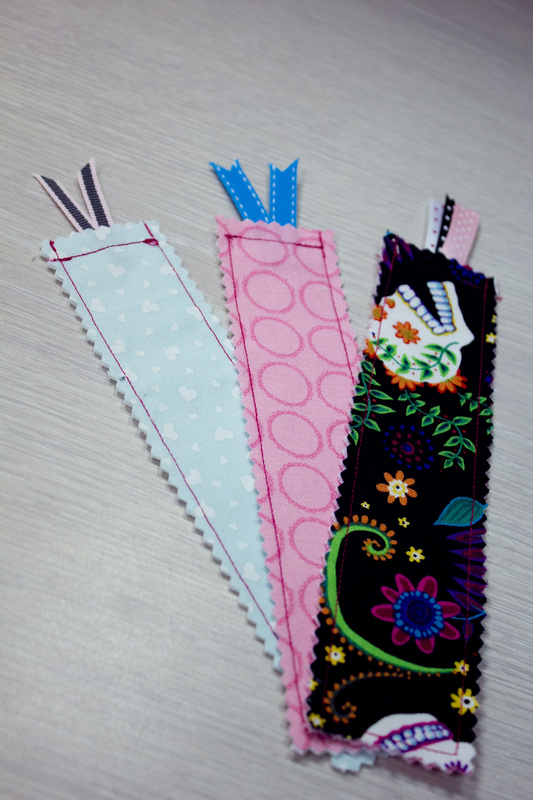 No matter, I picked up a lovely ribbon and sewed the pieces on to create handles. I love my first pouch! Just ignore the messy stitching of the handles. It now holds my Portland Gusset WIP. Lol! Well done J. So what’s next? Wheeeee! Congratulations!!!!! Definitely try and try some more before you buy. Your bookmarks and little pouch are all adorable! Thank you! I love it and find myself craving to do some more. Might go back to reMADE this weekend just for it.